SAQA is an international non-profit organization dedicated to promoting the art quilt and the artists who create them. 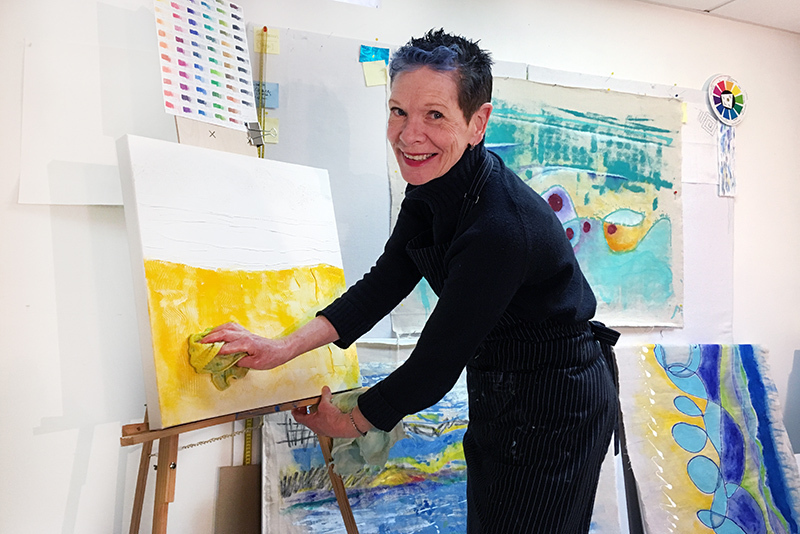 Julea is an abstract acrylic and mixed-media artist, a modern quilt designer-maker and a part-time contemporary dance company manager. She is also an Artwork Archive artist and SAQA Atlantic (Studio Art Quilt Associates) member from Frenchfort PEI, Canada. She recently launched her online portfolio on Artwork Archive and sat down with SAQA to tell them about how she came to that decision. Check out Julea's new Artwork Archive Discovery Page. How did you come to choose Artwork Archive for your online presence? JB: Actually, I was searching for a simple art inventory system before even realizing it would serve the purpose of also being a public portfolio. Last fall, when I was making several submissions of my work, the job of pulling together all the details for the submissions from scratch each time became a real chore. It was cumbersome finding files, remembering which image was the latest perfectly-cropped final version, finding the details of the piece, dimensions, specific materials used, pricing and so on. My files were a mix-mash! All of a sudden I’d reached a tipping point and had a large enough body of work that I really needed a system to view all my work in one place and have everything readily at hand. It occurred to me there must be some ready-made web tools and sure enough, I found Artwork Archive. Julea Boswell's Artwork Archive Discovery Page. How many pieces do you have on the site? JB: I have 32 loaded in my inventory right now. But there are older ones I'll eventually add, such as the functional quilts I made before I started making art quilts and paintings. 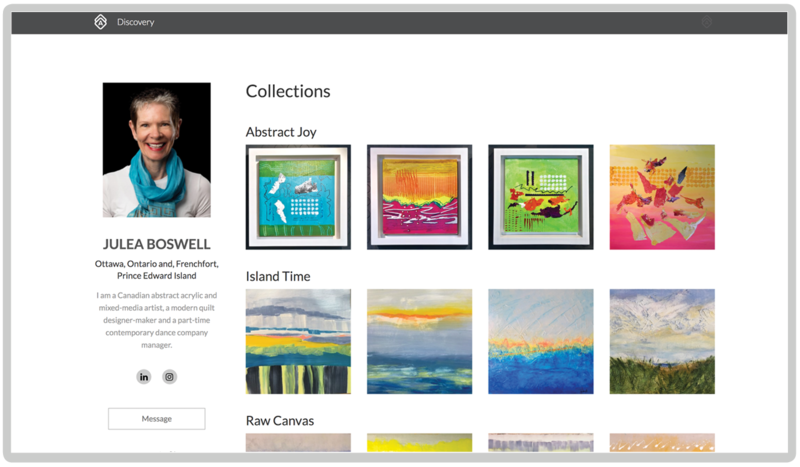 With Artwork Archive, you have the option to make a piece public, or not, with a simple checkbox. My priority was to get the ones I wanted to show publicly on the site first. How simple is Artwork Archive to use? JB: If you can drag and drop images and fill out an online form, it's literally that easy! Once you load a couple of pieces, you really get to know it. There's a drop-down menu where you can choose the status of the work too: in progress, available, sold, destroyed, archived, etc. JB: It's free for the first month with up to 50 pieces. That was fine for me to get started. There are then three levels of payment. The cheapest, at $6 per month, allows for up to 50 artwork records and includes a profile on the Discovery Platform. That's what I have for now. 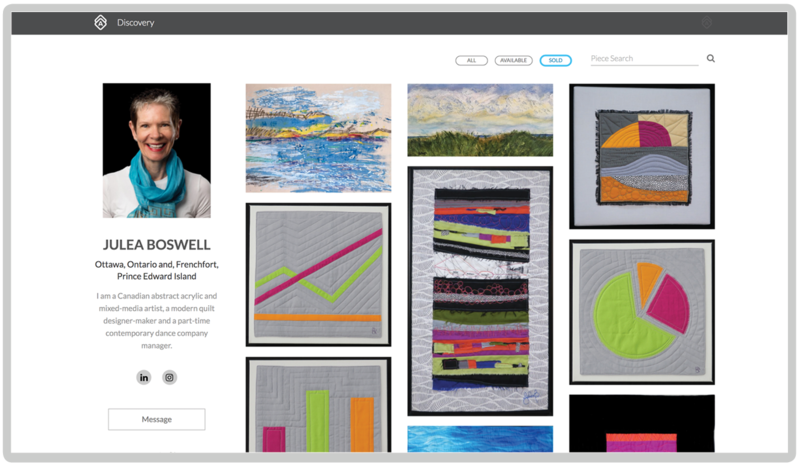 For $12 per month, you can integrate that portfolio into your own website and manage the inventory aspects from Artwork Archive. Is there a way to back-up or download your files if you need to, for example, if Artwork Archive should no longer meet your needs? JB: All the main data items are fully exportable. You have the option to export to a CSV or Excel file anytime. How does it work as an online portfolio? JB: This is what I think is really great. I was at the point where I knew I should be creating a website, but it seemed like a bigger job than I had time for right now. As soon as I saw that Artwork Archive could be a public portfolio too—and the portfolios I looked at were all great—I just went for it. Every time I add a new piece to my inventory it can become part of my public portfolio with one click. Another thing I find really good is the way you can organize the work by "collections". I work in different mediums and my work is varied in style. I wanted to find a way to present both my art quilt pieces and my other work in a cohesive way. Would recommend Artwork Archive as both an archive and a web presence? JB: For sure. If you're an artist who would like to create an online presence, don’t hesitate. New tools like this make it easy and allow you to work along at your own pace. The biggest job is the initial upload so don't delay, the more pieces you have the bigger the job becomes! Thank you to SAQA, Julea Boswell & Cathy Drummond for the original interview. This transcript originally appeared in SAQA Atlantic-Canada. 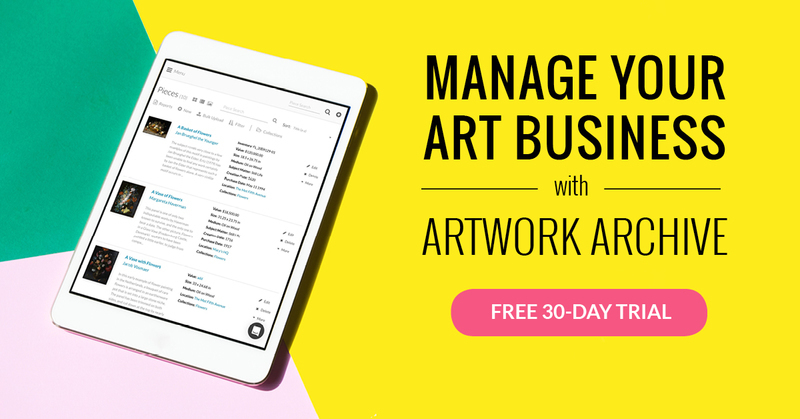 You can give Artwork Archive a try for free for 30 days and see why Julea made the switch. In case you missed it, we go over why art inventory can grow your art career and how to start.